I like pinwheels as much as anyone, but I can’t say I enjoy a 56-word puzzle. (Unless it’s by Patrick Berry, who used this same diagram with much smoother results in 2006.) There’s a preponderance of roll-your-own fill and repetitions. UNMIXED is dull, but it crosses the weird UNTAPE and then the next quadrant has the terrible UNNAILED. We’ve got the roll-your-owns RESOLE, CUSSER, and JAILABLE; the repetitive I RAISE and contrived I’M SAD; plural name QUINNS; the contrived mini-theme of “TAKE MORE” and “HAVE A SIP.” If you think I’m being too harsh, please do click the link earlier in this paragraph and compare the fill in the Berry puzzle to what we have here. I actually like the southwest quadrant a lot, except for B-STARS and that HAVE A SIP. WEASELED, “HOPE NOT” (although “I hope not” is more complete) HARANGUE … solid. Elsewhere in the grid, I like OPEN PLAN, DRUM ROLL, and DIVE BAR. The southeast corner crosses some really tough fill. 43a. [Spiny fish named after a bird], SEA RAVEN?? And the quaint 37d. [Piece of armor worn over the shin], GREAVE? I used a Google news search to see how much CUSSER, UNTAPE, UNNAILED, and so on are being used in the wild. (The answer? Not a whole lot.) Imagine my surprise when Google included stories that used “unfucked” in the search results for UNNAILED! 20a. [High points? ], UMLAUT. Two little points, just above a vowel … but not really all that high if you think about the size of the typical bit of text. 48a. [Ronda ___, mixed martial arts standout of the 2010s], ROUSEY. I hope you don’t think this athlete’s name is obscure. She’s in about 3,700 times as many news stories as CUSSER or UNNAILED. I’ve run out of things. 2.5 stars from me. If you’re going to reuse a low-word-count Berry grid, keep working on it till your fill is as good as Berry’s. I feel like we’ve seen something like this before, with a double helix shape-theme, but I’m always game for a shape-theme, so here we are. There are a few bits of fill that were a stretch, even, maybe for the Chronicle of Higher Education (and I work in higher education…) such as [32d: Heavy stick carried by Indian riot police]: LATHI (new to me) and [39a: Texas hometown of Gene Autry]: TIOGA, which is a place-name I associate with a county in New York State instead of a town in Texas. I would’ve clued (and did clue, in another puzzle) [71a: ___ Gowdy (South Carolina congressman and former Benghazi investigator)]: TREY as [Phish frontman Anastasio], but perhaps that’s my personal frame of reference. Also, I just learned that the clue for ALOP, [10a: Catawampus], is etymologically related to kitty-corner. 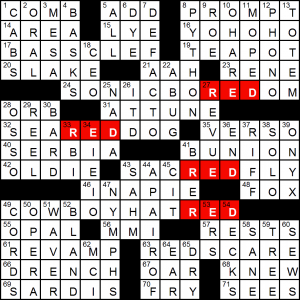 The REDSCARE – of Communists infiltrating American institutions – is illustrated by RED infiltrating four theme answers creating wacky clues. The surrounding pronunciations change dramatically in most cases. 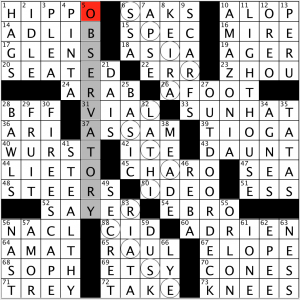 You can see the RED highlighted answers in the grid to locate the four theme entries. [Rum accompaniment? ], YOHOHO. From RLS. [Ease, as thirst], SLAKE then [Cry of one whose thirst is eased], AAH – clecho! I didn’t see that solving as I didn’t do those clues in order. [Kvbrick opvs? ], MMI. 2001, A Space Odyssey – cutesy Roman signalling for a crummy Random Roman Numeral answer – no thanks. [Island vacation ride], MOPED. I know what a mo-ped is, but I don’t know how this connects to an island vacation. [Doug of the Sir Douglas Quintet with the hit “She’s About a Mover”], SAHM. I’m not sure why this is crossworth-y. That song is their sole hit, and went all the way to #13. I can sort of get naming the band, but being expected to name members, even the titular one, is a bit much. This entry was posted in Daily Puzzles and tagged David Alfred Bywaters, Joe Krozel, Randall J. Hartman. Bookmark the permalink. If you’re offended by SEARAVEN, imagine having confidently and pridefully plunked down SEARobiN off just the clue. Then you’ll truly hate SEARAVEN. I was going to defend SEARAVEN as a real thing I totally have heard of… Except nope, I was thinking SEAROBIN. The fill was bad, but the puzzle was easy—so at least it was over quickly. That’s a close call, in my opinion, and if I had to make a pick I’d go with today’s puzzle. The Berry puzzle may have slightly fewer objectionable entries (though ones like LUMPER and ACREAGES hardly bring the kind of smile you’re looking for), but most of the fill ranged from solid at best to fairly pedestrian. The Krozel puzzle compensates with a greater number of worthy answers (e.g., MESS TENT, DRUM ROLL, ACQUIRED / TASTES, MPEG FILE, DIVE BAR, IV TUBE), which provides a bit more pleasure for solvers. Except that there were three of them, I didn’t find any of the UN___ answers too bad (UNNAILED may be the worst, though it does describe the loose board I found while doing some painting not long ago so I won’t complain). Googling “JAILABLE offenses” makes me think it’s a useful word in legal circles. The new-to-me SEA RAVEN seems gettable as clued, no worse than the bird REDSTART in the Berry. And I did like the “High points?” clue for UMLAUT. No 3- or 4-letter answers. I’d guess this was a hard grid to fill. Altogether pretty well done, I think. Yeah, I agree. I was surprised at Amy’s take on this one. Today’s the rare day where I agree more with Rex Parker than Amy — I thought this was pretty good even though I usually wince when I see a low-count, quadrant-based grid. UNNAILED is probably the most questionable entry, but it’s okay. I think the reason this one works so well is that the entries that lead into the quadrants are all very solid and smooth, so it doesn’t feel like four segregated puzzles as quad puzzles usually do. The footholds were firm. I have a one-year-old and a four-year-old, so as soon as I saw the diaper clue, I thought “It’s UNTAPE” and didn’t doubt the legitimacy of that entry for a second. Patrick Berry is the Master, but this was just fine by me. Four stars. I enjoy the pinwheel format. Ronda Rousey is now in the WWE. Last week, we had a reference to Mean Gene Okerlund. If you get a chance to see the HBO special Andre the Giant, you will see Mean Gene. It is a great show and shows how wrestling developed. 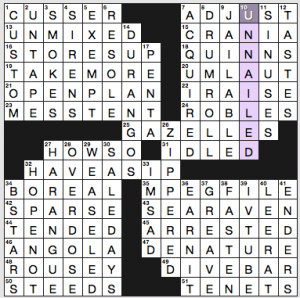 I was surprised that UNNAILED made it into the grid and I RAISE is definitely unidiomatic. I have heard players use it, but usually in some context where the raiser has some ulterior motive in adding the superfluous “I”. I enjoyed the puzzle and as noted, it was pretty easy. NYT: Good GREAVE! That Southeast corner did not yield until I cheated on SEARAVEN. I enjoyed the NYT much more than you Amy. I thought Sea Raven was a fun little bit of trivia, and GREAVE didn’t feel obscure. Sure, too many UNs but overall a fun puzzle. There *was* too much focus, I suspect, on Scrabbl-y fill rather than smoothness. It looks pangrammatic to me although I didn’t fully check, but you could ditch a few of the tough letters and improve this. Overall though I thought this was a very nice solve. Two thumbs way up for the NYT puzzle. Implying that Joe Krozel appropriated somebody else’s grid pattern, and then just didn’t try hard enough to get a good fill, is extremely rude. I think this vocab is every bit as good as Berry’s, because it’s more varied, Scrabbly, and interesting — but then, I don’t think “smoothness” should be the goal of a freestyle puzzle. What is a pinwheel? Is is something other than a four-quadrant, ultra-low-word-count grid? And there are also puzzles with four theme answers arranged in a pinwheel fashion, two Acrosses and two Downs. Not sure if Jim Horne coined the term or borrowed it, but he highlighted a few “pinwheel” grids at his website. NYT was too easy IMO. Liked the clue for UMLAUT and the DRUMROLL entry. Not sure I’ve done any pinwheel that didn’t have its problems do to the constraints. The Berry puzzle’s certainly more difficult. Liked the LAT theme and the CHE’s visual design/theme as well. Cheers for a good Friday round! NYT was awesome. Lots of fun, fresh fill, and it was indeed a pangram. Loved seeing JAILABLE, CRANIA (I thought BIPEDS are first), WEASELED, and SEA RAVEN. My grades are lower than the Crosswordfiend reviewer ~90% of the time, so I’m really surprised by the 2.5 stars today. The fill didn’t blow me away, and the abundance of UN- words didn’t help its case, but this was solidly executed and it was a very fresh puzzle. OVERDOSE, ROUSEY, DRUMROLL, WEASELED, DIVEBAR, SINUSES, HARANGUE are cool entries. Yes, we also had to have ZIPPERED and BSTARS but that’s a fair price to pay, I think.